The Charlie Brown Movies for kids and adults span the entire year. You can find anytime movies and special holiday movies starring the Peanuts Gang...Charlie Brown, Lucy, Peppermint Patty, Marcie, Linus, Woodstock and of course, Snoopy. Watch as these kids wait for the Great Pumpkin or as they decorate a little tree and make it something wonderful. Fun to watch and wiser than their years these characters have endeared themselves to us through the years and will continue to enchant future generations. Get your DVDs today! To find more information and see what these DVDs look like just scroll down. Charlie Brown movies are for anytime of the year and for kids of all ages. Watch Charlie and the gang in their Valentine's Day Special. I love Charlie Brown movies! he romantic yearnings of that eternally hapless hero, Charlie Brown. As Valentine's Day approaches, Lucy tries to get Schroeder to give her a card, Sally chases after Linus, and poor Charlie Brown dreams of getting just one valentine. Even Snoopy's mailbox is stuffed with those red heart-shaped cards--doesn't ANYONE love Charlie Brown? Another fun holiday special with the Peanuts gang is the Easter movie, Peanuts: It's The Easter Beagle Charlie Brown. Charles Schulz's Peanuts gang go on a fun-filled Easter egg hunt, and this year they even get a glimpse of the Easter Beagle who looks suspiciously like a certain pooch. Broadcast in 1974, this delightful holiday special brims with the dry humor and sardonic wit that made the comic strip so popular over the world. Coming out to participate in the egg-basting mayhem are Lucy, Peppermint Patty, Marcie, Linus, Woodstock, Snoopy, and of course Charlie Brown, making for a delightful ode to all things Easter. A Halloween movie or a Thanksgiving movie for the kids are the two Fall Charlie Brown movies to pick from. All of the Peanuts gang dress up for the enchanting night of Halloween. 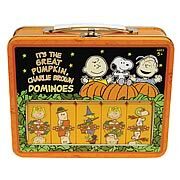 All, that is, except for Linus, who firmly believes that this year the Great Pumpkin will finally visit his humble pumpkin patch. When Peppermint Patty invites herself and the entire Peanuts gang to Charlie Brown's house for Thanksgiving, the results are all too predictable, but chef Snoopy and pilgrim Woodstock carry the day in this Emmy Award winner. The Christmas holidays have their own special Charlie Brown movies for kids of all ages to enjoy year after year. post-Charles Schulz Christmas special based on his timeless Peanuts characters, I WANT A DOG FOR CHRISTMAS, CHARLIE BROWN shifts the focus to Lucy and Linus' younger brother Rerun. Ignored by his blanket-toting brother and tormented by his uber-bossy sister, Rerun longs for a canine companion to brighten his troubles. But things look bleak for the lonesome tot when his mother refuses to get him a dog for Christmas and Charlie Brown declines to sell Snoopy--until he learns that Snoopy's brother Spike will be coming for a Christmas visit! Then it's time for some holiday mayhem as the rambunctious Spike brews up some mischief and it's up to the unfortunate Rerun to straighten out the mess. I WANT A DOG FOR CHRISTMAS, CHARLIE BROWN is a worthy addition to the animated pantheon of Peanuts classics. And then there are the Charlie Brown movies that are fun anytime of the year. Just when it seems homework is going to ruin their lives, the Peanuts kids learn to make it fun. Partially based on the stage musical of the same name. Woodstock wins at tennis and Peppermint Patty revs up the engine on her cycle when everyone goes gung-ho over Motocross racing. But does perpetual sad-sack Charlie Brown stand a chance? This freewheeling celebration of sports from the Peanuts gang won an Emmy for Outstanding Children's Special. 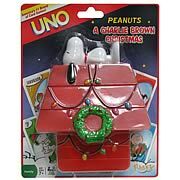 Find more fun ideas for Charlie Brown parties and Christmas coloring pages at our Charlie Brown Christmas Coloring Pages. 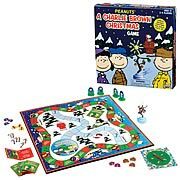 You can find not only Charlie Brown movies here but these interesting games and gift ideas. Just click on any picture to find out more about these unique and fun Charlie Brown gift ideas. If you are a Peanuts fan you might have a collection that needs some of these funny game ideas. Click the pics to enter a Charlie Brown Gift ideas catalog with some really fun stuff. Click on the picture to see this Snoopy costume or to find other Charlie Brown Halloween costume ideas for babies, kids and adults. Halloween board game! Based on the Peanuts It's the Great Pumpkin, Charlie Brown animated TV special. Game pieces of Charlie Brown, Snoopy, and more. It's great holiday fun for the family! It's like a holiday special, only there's no TV and nothing to plug in! 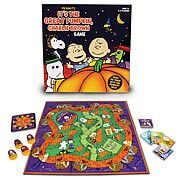 Derived from the Peanuts Halloween It's the Great Pumpkin, Charlie Brown animated TV show, this boxed set features game pieces of Charlie Brown, Snoopy, and more, as well as a board for you to enjoy. The game is designed for ages 5 and up, and is fun for 2 to 4 players. Move around the neighborhood, get some candy, and share your plunder with Linusâ€¦ then you'll be the winner! It's like a holiday special, on there's no TV and nothing to plug in! 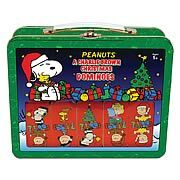 Based on the classic TV show, this boxed set features molded plastic game pieces of Charlie Brown, Snoopy, and more as well as a board for you to enjoy. The game is designed for ages 5 and up, and is fun for 2-4 players. (If the fifth player prefers watching, it will be fun for him or her too.) Decorate the tree, give gifts, and win! Dominoes featuring Peanuts character art! Snoopy, Sally, Linus, and more! Fun for 2 or more players! If you love dominoes and don't much care for dots, we have a special treat for you! This distinctive set of red plastic dominoes is cast in red plastic, and each piece features characters from the special printed right on it! You'll enjoy the Christmas tree, Lucy, Snoopy, Charlie Brown, Woodstock, and more! It's great fun, and a wonderful decoration too! All the fun of UNO, Snoopy-style! Awesome holiday themed cards for the play directors in your life! Hours of gaming fun! UNO gets you into the charming yet savage world of Peanuts ! Join Charlie Brown, Snoopy, and the entire Peanuts gang! Don't forget to yell "Uno!" when you're down to one card - it's the only way to win! Dominoes featuring Peanuts character art! Snoopy as The Red Baronand more! Fun for 2 or more players! If you love dominoes and don't much care for dots, we have a special treat for you! This distinctive set of plastic dominoes is cast in orange plastic, and each piece features characters from the special printed right on it! You'll enjoy the Red Baron, Charlie Brown, Lucy in her witch costume, and more! It's great fun, and a wonderful decoration too! Read more about the Peanuts gang before you watch any the Charlie Brown movies. Peanuts is a syndicated daily and Sunday comic strip written and illustrated by Charles M. Schulz, which ran from October 2, 1950, to February 13, 2000 (the day after Schulz's death), continuing in reruns afterward. The strip is considered to be one of the most popular and influential in the history of the medium, with 17,897 strips published in all, making it "arguably the longest story ever told by one human being", according to Professor Robert Thompson of Syracuse University. At its peak, Peanuts ran in over 2,600 newspapers, with a readership of 355 million in 75 countries, and was translated into 21 languages. It helped to cement the four-panel gag strip as the standard in the United States, and together with its merchandise earned Schulz more than $1 billion. Reprints of the strip are still syndicated and run in many newspapers. The Little Red Headed Girl was a girl Charlie Brown had a crush on. 555 95472 I don't know what that number is...but it was listed on Wiki along with the list of characters.